AOA staffer Aya Nameth interviewed Brian Jump, director of our multi-day tours department and employee of 20 years, to get some insight into his unique perspective on traveling to Havasupai’s waterfalls, how the place and AOA’s relationship with it has changed in 2 decades, and what 20 years in Havasupai means for AOA. Have you ever experienced a summer that changed your life forever? Long days, warm nights, endless sunshine and relaxing with friends, this is the stuff most adults caught up in the day to day grind day-dream about. 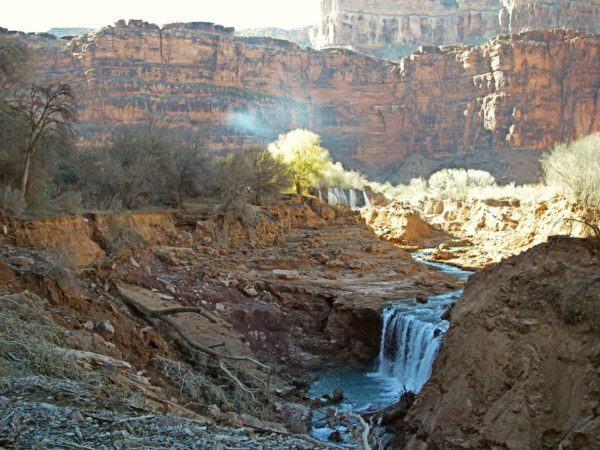 The summer of 1998 was one of those unforgettable summers for AOA founder Seth Heald and his best friend Brian Jump, and it introduced them to Havasupai, one of those rare places that beckons you to ease back into those carefree childhood summer memories. Brian moved to Arizona to help Seth with his new business endeavor in February of 1998. He was a fresh-faced 20-something with no intention of staying in Arizona long term nor a clue that he would eventually spend up to 120 days a year deep in the Grand Canyon. 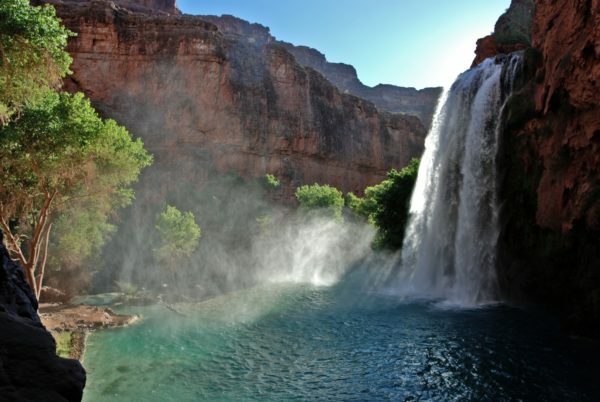 But it was that summer in ‘98 that Brian first hiked into Havasu Canyon and was mesmerized by this waterfall paradise, home to a native tribe known as the Havasu Baaja, the people of the blue green waters. AOA was a young but growing hiking tour company and social media didn’t yet exist to draw travelers to the blue-green water of Havasu Falls. 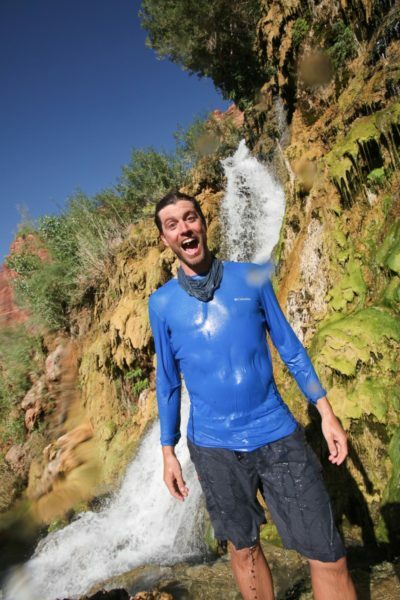 Guiding hiking trips to Havasupai seemed natural, obvious. People needed to know about this place! Within just a couple of years guiding into Havasu Canyon, Brian Jump was spending up to one third of the year in this remote canyon. I sat Brian down and asked him a few questions about his experiences there. Q. Do you remember the first time you hiked into Havasupai? A. Oh yeah, I remember it really clearly. Seth, myself, Chris Jolley (AOA Partnership Sales), and our friend Jason Weed went together. We went down, checked it out, hiked in one day, hiked to the [Colorado] river one day, then hiked out the next day. Seth had already visited a few times in college and the purpose of this trip was to scout it for the possibility of AOA’s first multi-day trip. We all knew right away it was definitely something we should do. Q. What about AOA’s first guided tour in Havasupai? A. The four of us I mentioned before were the guides – Jason, Jolley, me, and Seth. We had over 20 people with us, friends in the tourism industry and friends of theirs, so a group of people that were kind of extended friends. We wanted to show them what we could do on a hiking trip in Havasupai. I was the original AOA chef so I came up with a bunch of meals, I remember one of the meals was pasta and fresh tomatoes, basil, garlic, and olive oil and we also did salmon. We actually forgot a cutting board so we used the back of a frisbee. We were just kind of figuring it all out but otherwise it was a great first trip! Q. Have you formed friendships with any members of the tribe? A. Absolutely, in the early days we were each working down there enough that we forged some relationships with the helicopter folks that worked dispatch, and with the folks that worked at the tourist enterprise, Billy Jack and Suzy Siyuja. We’d have Bill and Suzy come down to the campground and have dinner with us and Big Mike from the helicopter and his family would come down too, so the interactions between AOA and the tribe, and the interactions with our guests have always been very friendly. Q. What was the first trip after massive flood of 2008 like? A. Seth went down there first. He was one of the first non-Havasupai down there after the flood and he walked around with one of the locals and was probably one of the first people to swim below Rock Falls (one of the waterfalls created in the flood). I don’t recall when my first trip back was but I remember I actually wasn’t devastated I was just awe-struck by how much had changed, the elevation in the campground, the massive debris fields of trees and rocks, and how altered the waterfalls were from one incident. Q. Has social media changed the canyon? A. It seems like it. I mean when people started sharing pictures, Supai was one of the first places that got social media famous to the point where it could begin to jeopardize the experience for people that live there and the people that visit. Now it’s nearly impossible to get a permit and litter being left in the canyon is an ongoing challenge. It’s funny, but now I see how social influencers have changed their style of posting and now most won’t tell where the location is. Q. Are you worried about the future of Havasupai? A. I always worry that the spring water will change direction underground and [as a result the creek] won’t flow like it always has. It’s an unbelievable miracle that all the water in the creek starts as rain on the south rim [of the Grand Canyon] and filters through hundreds and hundreds of feet of rock and comes out in that one side canyon. To think if it would ever just stop, it would be tragic. It was even brought into further focus when the flood of 2008 happened, just the fact that the water diverted to a new location and made one of our beloved waterfalls [Old Navajo Falls] go away. It created new ones and it’s still a beautiful, amazing place and the new waterfalls are probably equally as amazing as Navajo was. New Navajo Falls is my favorite place to explore and hang out, but I have some of my fondest memories hanging out at Old Navajo. Q. How is Havasupai different in 2018 than it was in 2000? A. 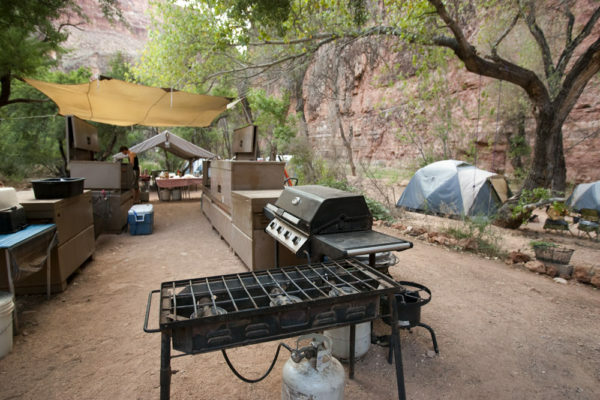 Well from 2000 to 2009 we had a permanent camp setup that no other outfitters were permitted to have, due to our longstanding operations in the canyon. Our camp was just outside the horse corral and sat next to a 150-foot long section of the creek that had a nice deep pool. We no longer have that permanent camp setup and of course the flood changed some waterfalls but aside from that it’s kind of hard to say, I don’t spend as much time down there as I used to. When I do visit it seems like things are pretty much the same, our trip style is still focused on an authentic experience, on camping, but the people, the tribe, they try to keep their lives the same, much as they have for centuries. Q. What impact has Havasupai had on AOA as a company and how did it impact the other multi-day tours AOA offers today? A. Well in a way , it delayed the development and growth of new trips because of how awesome Havasupai is. It didn’t feel like any itinerary could live up to Havasupai in our minds. I think it definitely prolonged the development of other multi day trips for AOA but it also created a model for us. The way we perfected our operations in Supai taught us all sorts of things about what elements make a guided trip great. We have used all sorts of lessons from the way we operate Havasupai to create other itineraries so when we develop new things we think “what’s gonna be our Mooney falls hike, what’s the Beaver day hike on this day?” We think about the moments that certain experiences create and how to recreate that in a new location in the way we build the itinerary so it has the right flow and crescendo to it. Havasupai has really been our bread-and-butter trip. Q. Does Havasupai still have a story to tell? A. Any place that beautiful, there is always a story to tell. It’s still the most remote village in the U.S. There’s people that have lived in the bottom of the canyon for generations with their only access being foot, horseback, or helicopter. If those waterfalls weren’t so beautiful and the water didn’t flow all the time there wouldn’t be a story I’m sure….Without the water there wouldn’t be a tribe living at the bottom of the Grand Canyon. That’s the source of it all, the mother of life.